Libyan revolutionary forces captured the city of Sirte after weeks of intense fighting and killed long-time dictator Muammar Gaddafi following a lengthy gun battle. 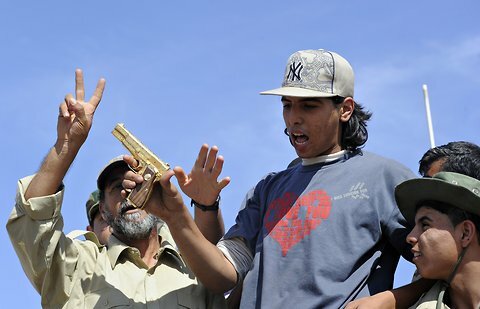 Very graphic cell phone video shows a slain Gaddafi as fighters celebrate around him. 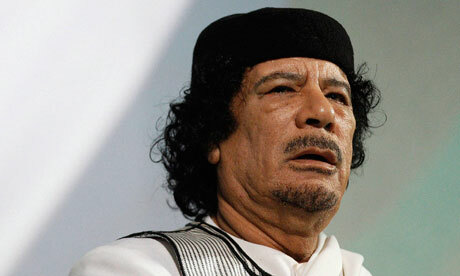 The Prime Minister of Libya confirmed the former dictator had been killed around 4:20 local time. One fighter said he witnessed Gaddafi being shot in the lower torso and then struck him in the head with his shoe, a grave insult in Middle Eastern cultures. 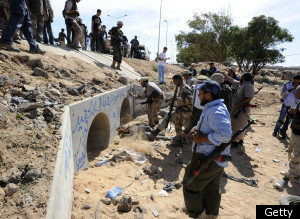 This image allegedly shows where Gaddafi was captured, a series of concrete pipes outside of hideout. Here’s video of Gaddafi after he was captured, but while he was still clearly alive. No word on what happened afterward. Secretary of State Hillary Clinton received word of his capture between interviews in the Afghani city of Kabul. Her reaction was simple: “Wow!” The White House will hold a press conference on the events in Libya around 2:30 p.m.